"Just Remember this...Mig Welding Aluminum exaggerates everything that can go wrong migging steel!.. " "Push when you can. Dead nuts straight in works too!.. " For Mig Welding aluminum.....You really need a spool gun. In this video, you can see that when mig welding aluminum, the weld puddle is pushed and not pulled. You can also notice the cleaning action of the arc around the edges of the weld puddle that breaks up the aluminum oxide and allows the puddle to wet in to the base metal. There are several aluminum mig welding techniques that work ok, but the one used in the video is just a slow steady motion. For 1/8" thick aluminum, unless you have the machine set just right, the slow steady bead just builds up too much heat because by the time you reach the edge of the metal, its really too hot and leaves a huge crater. Another thing to learn from this video about aluminum mig welding is that it uses what is known as "spray transfer". Can you See the tip of the wire? It never goes into the puddle. Fine little droplets of metal "spray" into the weld. When you mig weld steel with "short circuit transfer" the wire actually fuses into the puddle and then arcs back many times a second and makes that bacon frying sound. You do not want to hear a bacon frying sound when mig welding aluminum. IF you do, you have too much wire speed. Another technique that I like better is to use kind of a step and pause technique where you hitch ahead quickly about a quarter inch and then pause...to the tune of about once every second. So it goes like this. move ahead and pause...thousand one...move ahead and pause...thousand two.. This step and pause welding technique puts ripples in the weld like a tig weld. Almost like a stack of dimes. Another benefit is it seems to build up less heat by moving quicker. 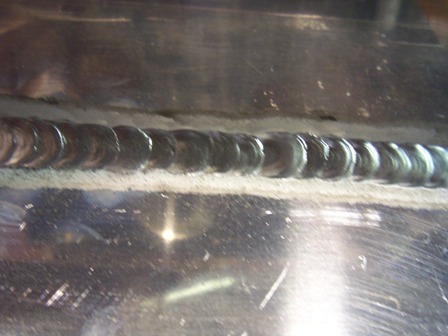 The picture below is of a weld that was done using a step and pause welding technique with the spool gun. The best way I have found to figure out the voltage and wire feed speed settings is to go to this link... millerwelds.com weld calculator . Then select process, material type and thickness, For 1/8" thick aluminum, the lowest recommended setting for 3/64" wire was 21 volts and 240 inches per minute. That will only get you started but it is a good starting point...since every machine is a little bit different, tweaking the machine while playing with some scrap aluminum will get you even better results. "spool guns make me feel powerful!.. " Aluminum wire is much softer than steel and is hard to feed very far thru a liner. That is the reason for spool guns. With a spool gun, the wire only has toe fed for a few inches. Whereas with a conventional mig setup, the liner is usually about 8-10 feet long. Trying to push soft aluminum wire thru a cable that long is challenging and mostly just not doable. The spool gun is the way to go. 1 pound spools of aluminum wire are loaded into a small gun that resembles a Tommy gun gun from old gangster movies. The spool gun is slightly less maneuverable than a conventional mig gun but the trade off is worth it in being able to consistently feed aluminum wire without bird nesting every few minutes. 100 % argon gas is usually the gas of choice but mixtures like 50/50 argon/helium can be helpful for welding thick sections.Make sure the polarity is connected properly. mig welding aluminum requires reverse polarity. Another way of saying reverse polarity is Direct current electrode positive or DCEP. The same polarity is used for welding steel with bare wire but since mig machines can be used for self shielded flux core wire also and some of those wires require using DCEN or Straight polarity, It is a good idea to check the polarity setup just to be sure. The 1 pound spools shown in this welding video are available in either 4043 or 5356 alloy and other alloys too, but these 2 are the most commonly used. 5356 is a bit stiffer and is easier to feed. It is commonly used for mig welding 5052 aluminum. But the 4043 wets out better and generally gets less porosity. 5356 is also slightly stronger. There are lots of considerations when choosing and there is a filler metal chart you can download at this link..... That has some valuable tips for choosing welding wire. In the second video,the suggestion for setting wire tension is excellent. Trying to weld with not enough wire tension will cause burn backs and lots of cursing. Set the tension tight enough but not too tight. Too tight and the drive rollers will mash the wire and cause other problems. 1. Push dont pull. Pushing works much better whenever you can... But we both know that sometimes you just gotta do what you gotta do. Pulling the weld will cause it to be sooty but its not the end of the world. A stainless brush will remove the soot. 2. when setting the wire feed speed, start out high and then adjust lower. You will save lots of tips this way, trust me on this. 3. dont try to get the bacon frying sound like with steel, if you are getting this sound, your wire feed is a little to high. you are looking for a high pitched humm. 6. keep a new pack of tips in your toolbox cause... damn! - mig welding aluminum , even on a good day , goes thru some tips. It is possible to mig weld aluminum without a spool gun. I used to work in a shop that did this. A short mig cable, a teflon liner, and a softer tension spring allowed us to weld pretty well. The trick was to angle the mig gun to that about an inch of wire fed out before it contacted the weld area. Then you could change to a normal welding angle. If we didnt do this, we got a lot of burnbacks because the mig machine did not have any run out or wire feed delay features.